Simply Celebrations & Events: Wedding Website - How do I make one for my wedding? Wedding Website - How do I make one for my wedding? give your guests directions to your wedding ceremony and reception. A personal wedding website is the best place to do all of this. But you say "I don't know how to make a website!" And I say "You don't need too." And you can match your invitations to the same look as your website depending on which design you pick. One company gives you this option - Wedding Paper Divas. 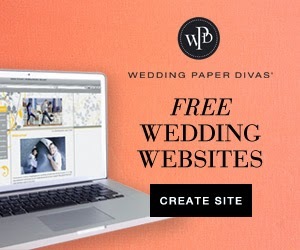 Wedding Paper Divas offers FREE wedding website templates to match more than 30 of their bestselling wedding invitations. This means that you can now easily create an ad-free personal wedding website complete with online RSVP capabilities and more—and keep it FREE for one year! Get started now to ensure that everything will be beautifully designed and perfectly coordinated as you prep for your big day. Click "Create Site" to check out what WPD has to offer. ﻿With Wedding Paper Divas templates, you can put together your own wedding website easily with your own photos, online guest RSVP, share your story of how you both meet and became engaged...and so much more. Wedding Paper Divas makes it easy for you to get it done and check one more thing off your list.